Keep your fans in the loop with your latest exhibition announcements and events. 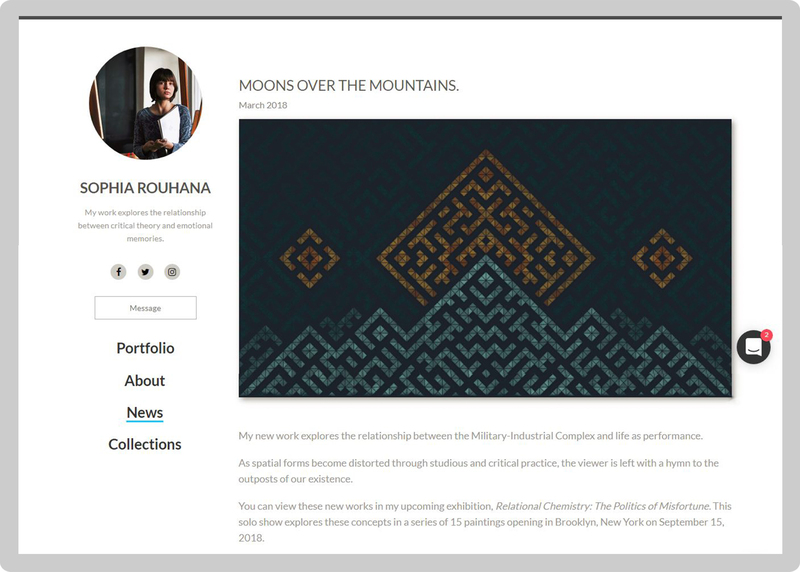 The News Page on your Public Profile lets you update your audience about the big news in your art career. Manage your announcements, save drafts, and publish stories about your artwork using our new simple blogging platform. Posts can be saved in published or draft state. When published they will show on your Public Profile. Select My Profile from the left-hand side menu and click My Posts in the top menu. Then, click the grey New Post below. To add a main image to your post, click Choose File or drag your image file into the box. Your image should be in landscape orientation (roughly 16x9 aspect ratio). 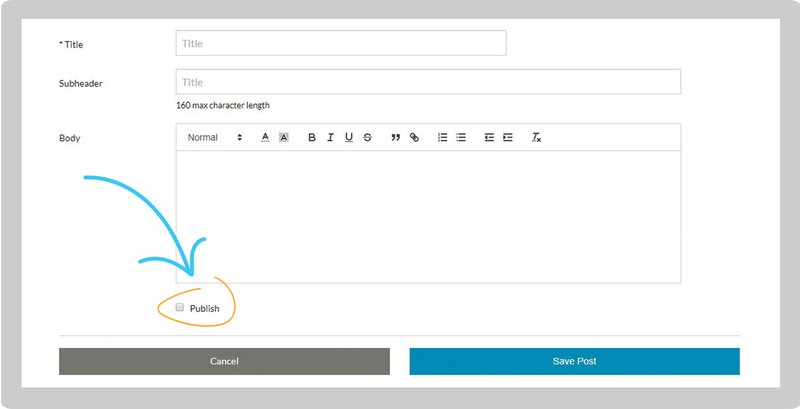 Then type or copy/paste in the Title, Subheader, and Body sections for your post. You can adjust the formatting for your Body text by adjusting the heading size, adding font color, quotation blocks, links, and more. Do not check the Publish box. Click the blue Save Post button at the bottom. You'll be redirected to the My Post page where all of your drafts and published posts will appear. Check the Publish box underneath the Body text box, then click the blue Save Post button. On the My Post page, click on the blue Title of the post you wish to edit. Or, on the My Post page, click on the blue Actions button to the right of the post. Click Edit from the drop-down menu. When you are finished editing, click the blue Save Post button. On the My Post page, click on the blue Actions button to the right of the post. Click Delete from the drop-down menu, then confirm that you want to delete the post. On the My Post page, click on the blue Actions button to the right of the post. Click Unpublish from the drop-down menu, then confirm that you want to unpublish the post. On the My Post page, click on the blue Actions button to the right of the post. Click Publish from the drop-down menu, then confirm that you want to publish the post. Or, click on the blue Title of the post you wish to publish. Check the Publish box underneath the Body text box, then click the blue Save Post button. On the My Post page, click on the blue Actions button to the right of the post. Click Preview from the drop-down menu. This is how your post will look once it's published. To edit, click the gray Edit at the top. On the Edit Post page, you can make any changes to your post, save as a draft, or check the Publish box at the bottom to publish to the News section on your Public Profile. Select My Profile from the left-hand side menu and click My Posts in the top menu. Then, click the grey View News Page next to the grey eye icon.